As the ‘Grand Fromage’ of The French Chef at Home, you’d expect me to have firm opinions on both cheese and wine! With Wine and Cheese Day coming up (25 July), I’m celebrating by sharing just a few of my favourite pairings with you. As mentioned in a previous blog, we were delighted to discover that Yorkshire takes its cheeses as seriously as we do in France. And a good cheese demands a good wine. I like to support other local businesses. 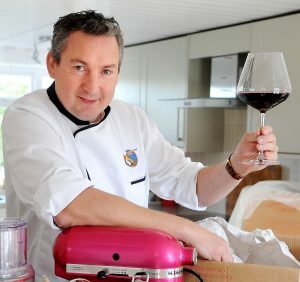 When I’m not visiting France to buy my wines directly from the producer, I source most of my cheese and wine from Minskip Farm Shop http://minskipfarmshop.com/ which has a small but extensive fresh food market. Much of the produce Ben and Emma stock is sourced from within 30 miles of the shop and all the wines mentioned below can be found there. My new favourite cheese is the soft and creamy Yorkshire Brie and I like to pair it with a dry, yet fruity Niel Joubert Pinotage from South Africa. A ripe plum flavour with slight smoky trace, the wine has a dry finish with ripe berry and spice notes. Closer to home, Château de Brague is a superior red Bordeaux that works well with a rich cheese. With its Merlot-based aroma and berry flavours, it’s perfect with Camembert au Calvados, a cheese produced in Lower Normandy that is marinated in Calvados brandy. But it’s not only red wine that works with cheese. Other great pairings include Picpoul de Pinet, a dry white, from France’s Languedoc-Roussillon region. The name means ‘lip stinger’ because of the wine’s zingy freshness. With aromas of blossom, Picpoul is comparable to the better-known Muscadet from the Loire Valley and represents excellent value. Its high acidity means it cuts through rich foods including creamy, firm cheeses made from sheep’s milk such as Ossau Iraty, another product of France’s South West. Finally, a bone dry and aromatic Loire Valley Sancerre will perfectly complement the rich flavours of Sainte-Maure de Touraine, an unpasteurised full fat goat’s milk cheese rolled in wood ash. 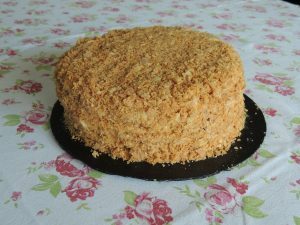 Gâteau Napoléon – a dessert fit for an emperor! Bastille Day or la Fête Nationale as it is better known in France is our favourite holiday and celebrates a key turning point of the French Revolution. Country-wide celebrations on this public holiday include firework displays and military parades and most people enjoy spending time with their families and loved ones. Food, as always, takes centre stage. 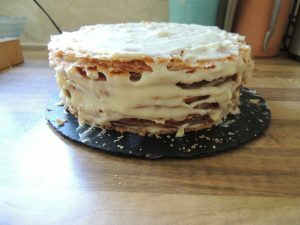 In celebration of the day and the subsequent rule of Napoleon as Emperor of France, I’d like to share my recipe for Gâteau Napoléon – a type of mille-feuille that is popular for festive meals and is a rich confection of multi layered cake and cream that melts in the mouth. It also remains a firm favourite in Russia after the victory against the French army of Napoleon in 1812 and has become an integral part of that country’s national culinary heritage. Mix the egg and cold water using a small whisk. Add the lemon juice and set aside. Place the butter in a bowl. Gradually add the sifted flour and, using a knife, mix everything until a coarse sand texture. Stir the egg mixture and mix to a smooth dough. Form a large roll of dough and cut it into 9 equal parts. Shape into balls, place on a plate, cover with plastic wrap and refrigerate for at least 1 hour or overnight. Preheat oven to 180 or gas mark 6. 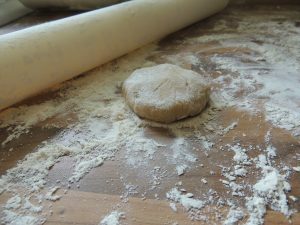 Roll out a dough ball into a circle of 22cm of diameter -approx. – and bake on a non-stick plate for 10 to 15 minutes. Repeat the operation for another 8 balls. After taking the dough out of the oven, while the discs are still warm, even out the edges to make circles of approx. 20cm, by passing the blade of a knife along a baking circle or mold. Reserve the dough scraps. Cream the butter with an electric mixer until light and fluffy. Add sweetened condensed milk and continue to beat until smooth. Put a dough circle on a serving dish, cover lightly with cream and sprinkle with the crushed walnuts. Cover with another dough circle. Repeat until all the dough circles have been used. Cover the last circle of dough with cream but no nuts. Ensure that the dough scraps are well crumbled. 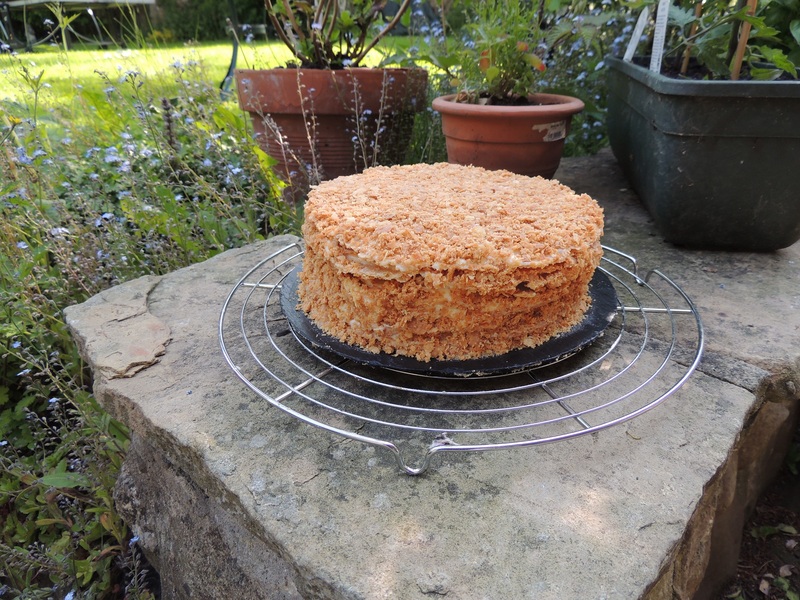 Sprinkle the cake with the crumbs to completely cover the top and sides. Not going away this summer? 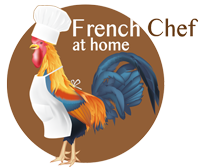 Enjoy a taste of France on a plate with my mushroom and quail tarte fine. I will be demonstrating how to make this tasty dish at the Great Yorkshire Show this Thursday 12 July. Brush each sheet of filo pastry with truffle oil. Using 10cm diameter moulds, form tartlets with the pastry and ensure that some extra pastry is left past the sides of the mould. Bake in the oven at 180°C until the pastry is golden. In a frying pan, brown the mushrooms and finely chopped shallot with butter. Leave for 5mins approx. on high heat. Poach the quail eggs in boiling water and 50ml vinegar for 90secs. Cool the eggs in an ice bath. Mix some truffle oil with some vinegar. Add salt and pepper. In a frying pan, fry the quail breasts with truffle oil until rosé. 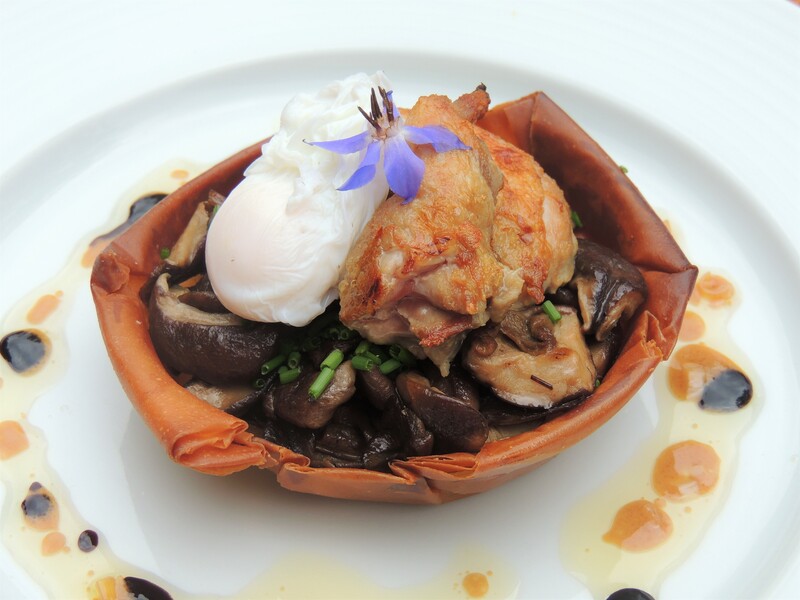 Fill the tartlets with mushrooms, add a quail breast and egg on top. Season with the vinaigrette. In a bowl, mix the egg yolks and the corn flour. Heat the milk on the hob and pour into the mixture. Whisk until mixture thickens. In the microwave or on the hob, melt the chocolate in a bain-marie then pour in the cream. Add to the mixture and mix well. Beat the egg whites and sugar until stiff peaks form. Add the mixture and fold gently. Grease the moulds and cover the base and edges with sugar. Pour the mixture into the moulds leaving a one cm gap from the top. Cook in the oven at 190°c for 12 minutes. To make the coulis, place the rhubarb and sugar in a pan and cook until obtaining a purée. Then pour in a blender with the fresh mint and blend. 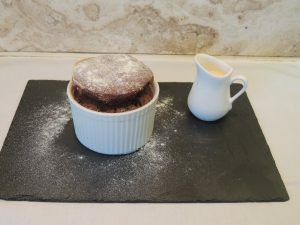 To serve sprinkle the soufflés with icing sugar and pour over the rhubarb and mint coulis.